Richard Herring has enjoyed phenomenal success as a writer and performer and is an innovator in the world of podcasts. In 2016 he will be touring his new show Happy Now?, which will also be released on DVD. He premièred the show as part of a season of shows at the Leicester Square Theatre which saw him revive each of his eleven consecutive stand-up shows for just one night only before debuting a brand new hour on the final night. 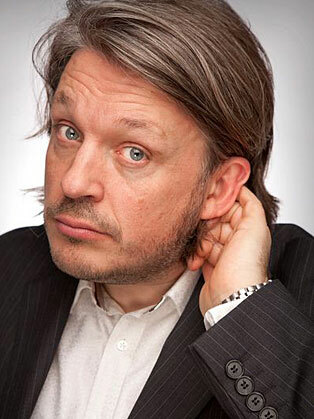 Persistently placing in the Top 10 UK Comedy Podcast chart, Richard Herring’s Leicester Square Theatre Podcast sees him interview top comedians in front of a live audience and is then released online both as videos and podcasts for free. Previous guests include Stephen Fry, Simon Pegg, Armando Ianucci, Russell Brand, Stephen Merchant, Steve Coogan, Tim Minchin, David Mitchell and Stewart Lee. The show regularly has up to 200,000 listeners per episode, won three Chortle Internet Comedy Awards and is the only non-BBC show to ever win a Sony Best Comedy Award. Richard’s audio podcast and sketch show As It Occurs To Me won a Chortle Award and was Sony-nominated. Richard Herring’s Meaning of Life was an independently produced web series performed in front of a live audience and broadcast via the internet for free. He writes a weekly column for the Metro newspaper and has a script in development with Channel 4. Richard’s has appeared as a guest on shows including Alan Davies’ As Yet Untitled (Dave), Pointless – Celebrities (BBC One), Argumental (Dave), Set List (Sky Atlantic), Have I Got News For You (BBC One) and Never Mind the Buzzcocks (BBC2). He also wrote and performed two series of Richard Herring’s Objective for BBC Radio 4. Richard has written and appeared in a number of critically acclaimed plays that have been performed at the Edinburgh Festival, including Rasputin, Punk’s Not Dead, Excavating Rita and It’s Not the End of the World. His one-man Edinburgh shows include the critically-acclaimed What is Love Anyway?, We’re All Going to Die, Christ on a Bike and Hitler Moustache. Richard’s blog Warming Up has gained a cult following since he started it in November 2002 and he has written an entry for every single day since it began, making it what is believed to be the second longest consecutive daily blog in the world. As one half of the comedy duo Lee & Herring, Richard Herring wrote and performed in shows such as Lionel Nimrod’s Inexplicable World (BBC Radio 4), Fist of Fun (BBC Radio 1/BBC Two) and This Morning with Richard Not Judy (BBC Two). Richard bought the rights to bring out both series of Fist of Fun on DVD with Stewart Lee via independent Welsh company www.gofasterstripe.com. With Al Murray, Richard devised and wrote 37 episodes of the sitcom Time Gentlemen Please (Sky One/Paramount) for Al’s alter ego The Pub Landlord. Richard also wrote and starred in the comedy drama You Can Choose Your Friends (ITV1).